George Gershwin, Kurt Weill, Charlie Chaplin and Friedrich Hollaender: These are just some of the colorful figures, whose work defined the early 20’s and the golden age of Hollywood. Their music inspired audiences on the concert podiums, at the cinema, and on the stage during the fraught and exciting time between the two World Wars. At the same time an era of great virtuosos like Jascha Heifetz, who enriched even triviality and rarity with the distinct, golden sound of his violin. 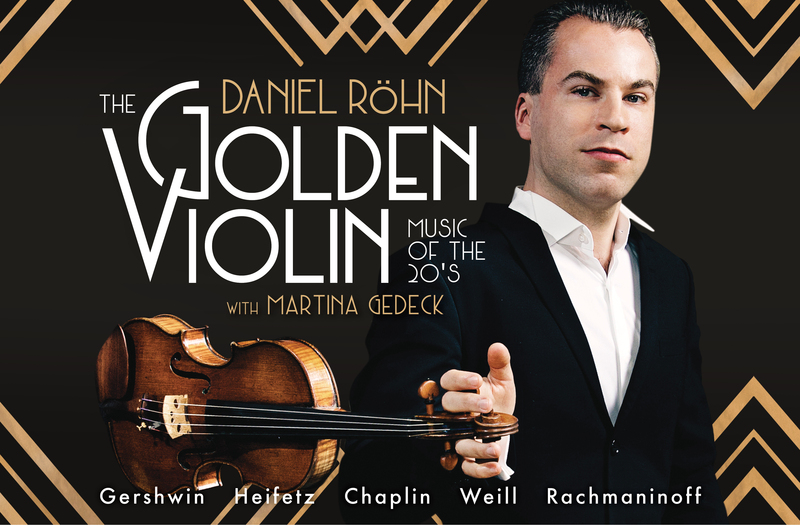 Following his traces, violinist Daniel Röhn will revive the musical world of the roaring twenties in New York and the Golden Twenties of Berlin. With texts by Djuna Barnes, Gertrude Stein, Hemingway, Fitzgerald, and Tucholsky, actress Martina Gedeck will reflect on the intellectual output of the time and will address not only the glamorous side of that time, but also the social tensions and political struggles which were equally paramount to defining the era. A concert evening of a different kind offering the intoxicating music, thoughtful lyrics, and beguiling melodies of an era worth celebrating.